We’d love your help. Let us know what’s wrong with this preview of Pairs by Smriti Prasadam-Halls. 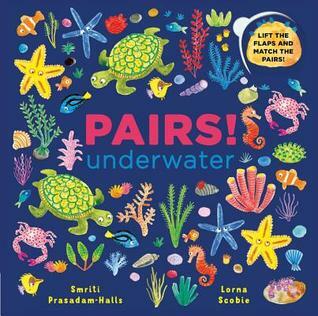 Pairs: Underwater: Lift the flaps and match the pairs! To ask other readers questions about Pairs, please sign up. A lift-the-flap board book in which readers are encouraged to find the matching pairs of ocean creatures and also practice their counting by searching for a given amount of a certain type of ocean animal in each spread. Rhyming text begs to be read aloud. Great for sharing with toddlers and PreK. This is a rhyming book to be read aloud to the little ones. It teaches ages 0-2 about underwater habitat while developing recognition and memory. The book's material is durable enough for the little ones to lift the flaps and find the matching pairs over and over again.